We love the holiday season because it gives us an excuse and reason to decorate! But it is a little bit sad having to stow away all your decorations after the holidays. It got us thinking that maybe, adding some D.I.Y. decor that transitions from the holidays to every day. This simple garland, and we mean simple because it's done in just three steps and uses seasonal greenery that can easily be picked up from any grocery store. We picked a variety of eucalyptus and boxwoods that not only bring the outside in, but smells incredible too! Get creative with your garland, no one said they had to just go over the fire place. You can dress up your favorite shelfie, drape it over your entry way mirror, or simply lay it over your entertainment console to instantly add some holiday flair. p.s. The one we created for this D.I.Y. has dried up beautifully and we love knowing we can leave it up even after the 25th! 1. Gather up all your supplies and snip your branches of greenery into 6"-8" stems. Pro-tip: Soak your trimmed stems in water so they can hydrate. 2. 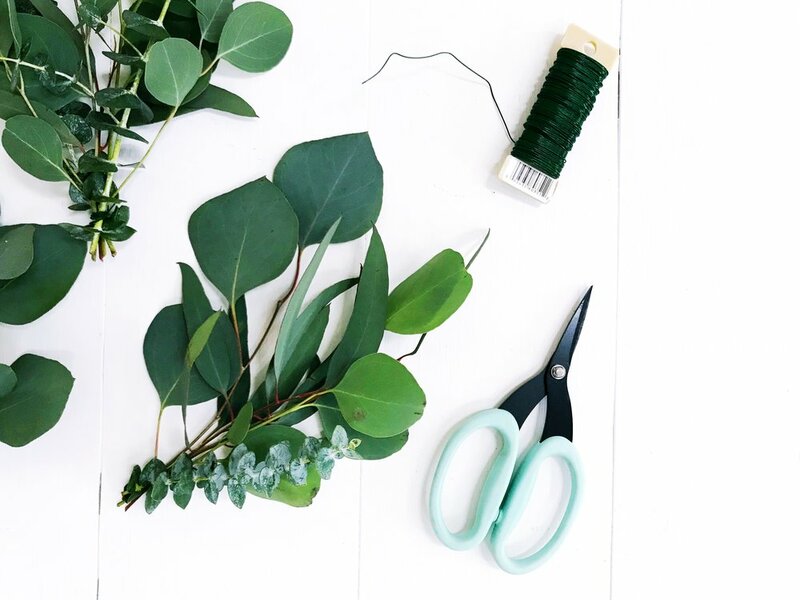 Pick a variety of your greenery (about 5 stems) and bundle them using a strip of floral wire. 3. Once you've created your bundles, join your bundles together using more floral wire until you have about 5ft of garland! Pro-tip: Mist your garland every couple of days to keep it hydrated while live. Your live garland should stay fresh for about 3-4 days.